Clint Smith successfully invaded Rome. 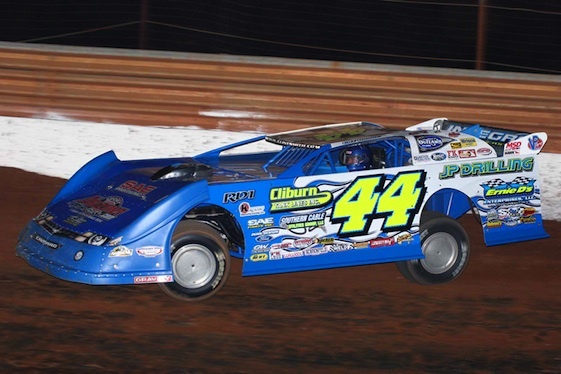 Clint Smith currently competes on the World of Outlaws Late Model tour as well as other races when his schedule permits. He has consented to write a series of diary stories for RacinToday.com. What follows is the second installment of that series. With the World of Outlaws not running, we started out to run the whole 10 races of Ray Cook’s Schaeffer Oils Southern Nationals. But as it turned out we had a court date over an incident on the interstate a couple of years ago, so we had to bail on the Nationals series and just pick and choose the ones around the house. We decided to take the motor out of our car to get it freshened up to finish the Outlaws season – kind of a mid-season freshen-up job on the whole car. We pulled our back-up car out to run the Southern Nationals deal. It hadn’t been run since Aric Almirola drove it in the Prelude to the Dream. My crew chief, Duane Treadwell, wanted to race since we were around the house, so we loaded his car and mine in the trailer and headed to Swainsboro, Ga., on Friday night to run our first Southern Nationals race. We fared pretty good. Duane made the show. He started about 15th and ended up falling out late. I qualified ninth quick, but you have to be in the top eight to get locked into the field in that series. Then they run two “B” Mains and take six out of them, plus two provisionals, which makes a 22-car field. We won our “B” Main going away pretty good. We started ninth and had a little bit of driver error and ran out of the race track on Lap 7. I came back on about 15th and worked my way up to fifth. As far as the first night out with that car since Aric drove it, we were happy with a top five. Then we drove over to Screven Motor Speedway, parked and slept through the night. We got up Saturday morning and did general maintenance on the cars. We had one broken valve spring and had to fix it. Vic Hill and Chris Madden came over and assisted me in getting my car ready to run against them, which I thought was pretty nice. We got all maintenanced up and had the third-quickest time in qualifying, so we started third in the feature. I got to second and got taken out by a fellow competitor, Billy Ogle, Jr. I guess he just ran in over his head and spun me out. That was at Lap 30. We went back to the tail and got back to 10th. But we were still running good, and Duane also ran. He was running 12th at one time, but he got in a mishap with Vic Hill, spun around and cut a tire, so he just called it off for the night. We came back to the shop, washed both cars and got them maintenanced up, fixed the damage we had, and headed out to my favorite race track, which as everybody who knows me knows is Rome Speedway in Rome, Ga.
Shane Clanton and I hooked up along the way like we normally do and followed each other up the road, stopped and got us something to eat at a little convenience store along the way – chips, drinks, ice, just stuff for the race track. It was a relaxing night. When we hot lapped we were about fourth quick so we felt pretty good about our car. Bubba Pollard, the asphalt racer who lives right there on the same road with us, came with me and worked on my shock program a little bit. The car was bottoming out, but we still had fast time by two tenths. Then Bubba dialed me in a little bit more after qualifying. We had a good race car. It turned out that Ogle, who had run over me the night before was on the front row with me. Everybody was nervous thinking we were going to do some retaliating, but that never pays off. I got the jump on the start, ran a clean race, set my own pace for 53 laps and got our first win of the year. We’ve been inventing ways to lose races, so I’m glad we finally invented a way to win a race. It seems like the hardest thing in racing is to get that first win of the year. When you get that one, it relieves the tension. I don’t think there’s any pressure involved, especially as long as we’ve been doing it, but when you get that one out of the way it makes it easier to get the next one. And it was nice to get it at Rome and to win one for Jimmy Mosteller up there. He passed away a few weeks ago. He and I announced together several years ago. I said something in Victory Lane about Jimmy. That made it more special. And my dad, Roscoe Smith was there and got his picture made with me in Victory Lane. Leon Sells was there too, so we kind of had a gathering of veterans around there. Now we’ll get the cars ready again, head to Phenix City, Alabama, Tuesday night to do it all over again.